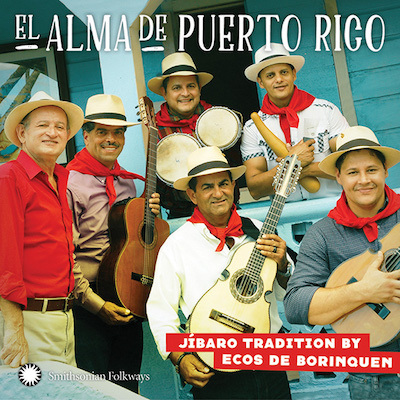 Oue most polished and tasty exponents of the Puerto Rican mountain music traditions, Ecos de Borinquen, has just released its second recording for the Smithsonian Institute—their first one being Jibaro hasta el hueso, which was nominated for the Latin Grammy award. You can sample and buy their latest noble effort visiting their page at the Smithsonian Folkways website. 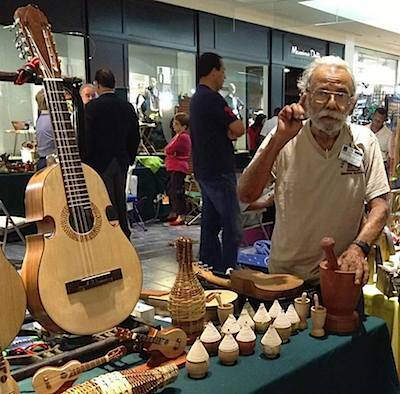 It grieves us to have to announce to our followers the death late June 2015 of the renown senior Puerto Rican traditional instrument-maker Vicente Valentín Rivera, who lived and worked in the town of Vega Baja. Don Vicente was a principal source for our Cuatro Project. With great humor and generosity, he made himself available to our cameras and constant questions. His rustic and prosaic manner hid a brilliant and profound understanding of his field, the traditions of his craft and a propensity to share and educate his compatriots around them. 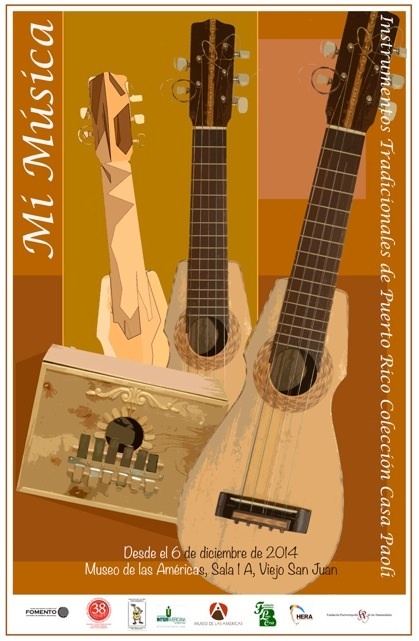 STRINGS OF MY LAND: A History of Puerto Rico's native stringed instruments: Cuatro, Tiple, Vihuela and Bordonua. The culmination of 22 years of field research and oral history in the field of Puerto Rican folkloric music and music craft traditions. 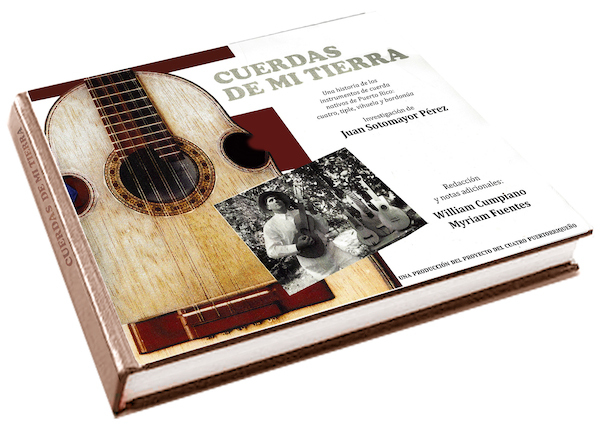 "This book is the most complete encyclopedia of our native stringed instruments": Nestor Murray Irizarry, director Center of Puerto Rican Folkloric Investigations, Casa Paoli, Ponce PR. Spurred by the recent receipt of this wonderful photograph of the great builder, we pause to remember the passing of the man believed by many to be Puerto Rico's finest cuatro maker—precisely 10 years ago this December. Read about his craft in his own words here. The Highbridge section of the Bronx celebrated the street re-naming of Ogden Avenue on 162nd & Summit to YOMO TORO PLACE on Saturday, July 27, 2013 on what would've been the King of the Cuatro's 80th birthday. 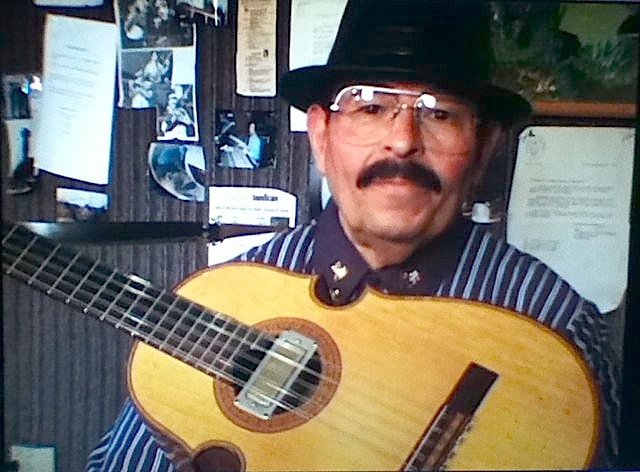 Known as the Jimi Hendrix of the small, ten stringed Puerto Rican cuatro, the "funky Jibaro" (hillbilly) was an icon of Puerto Rican culture and a Fania All-Star bringing the national instrument of the island into the commercial "salsa" world with his many recordings and compositions. It was the love of his daughter Denise Toro the engine for organizing this event in three weeks with no budget but with the help of a community and Yomo Toro's friends in the industry the small Bronx street that a superstar called home was re-ignited with the excitement, joy, and hope that many brought with them on this day. Orq. Broadway's Eddy Zervigon sent a statement as well as Oscar Hernandez of the Spanish Harlem Orchestra and Adalberto Santiago sent a recorded message as well as the noted Fania All-Star em cee: Paco Navarro. 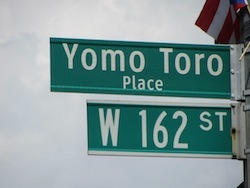 Ismael Miranda telephoned and spoke live to the crowd as he was patched in through the sound system before the street was unveiled to cheers from the many who attended & spoke about their memories of Yomo Toro. Among the many were: Jose Alberto, El Canario; Larry Harlow, El Judio Maravilloso; Eddie Montalvo & Nicky Marrero, Jose Mangual Fania All-Star alums; Frankie Morales, Papo Vasquez; Benny Bonilla, Rene Lopez, Johnny Cruz, Chembo Corniel, Bobby Sanabria, Junior Rivera, and Alex Masucci. Even Congressman Jose Serrano recalled his days as an em cee at the Bronx's Club Cubano when he would announce and pall around with Yomo Toro alongside Lorraine Montenegro who recalled the many times Yomo would sit all day on two milk crates playing his little guitar next to her mother Evelina Antonetty who was registering Latinos to vote in the Bronx. Representing the third great loss to Puerto Rican culture within barely five months, the gifted elder tresista [tres player] Mario Hernández (born Mario Casanova Clemente in 1925) passed away during the first week of January 2013, ending a long, illustrious career that established in great measure the manner in which his instrument is played today. Over the years we have built an archive of not only the accomplishments of the great master but also a history of the instrument he so wonderfully cultivated. Welcome to the Cuatro Project! We're a small, diverse group of music lovers of Puerto Rican descent who set out almost 20 years ago to discover all we could about the the musical and craft traditions surrounding the entire family of native Puerto Rican stringed musical instruments--with a special focus on the cuatro--the island's "national instrument." This website represents a summary of our twenty years’ (and ongoing) search. Please enjoy, share and participate! 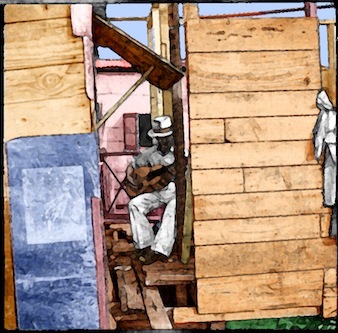 What did Puerto Rican music sound like in 1909? No, you won't need a time machine to hear Puerto Rican singers and players playing and singing at the beginning of the twentieth century. That's because those real sounds were captured and recorded on wax disks and cylinders--the earliest recording technology. These lay mainly hidden to the public in private collections. Would you like to hear an early four-string cuatro, or an actual bordonúa, or a tiple--just like they sounded 100 years ago? 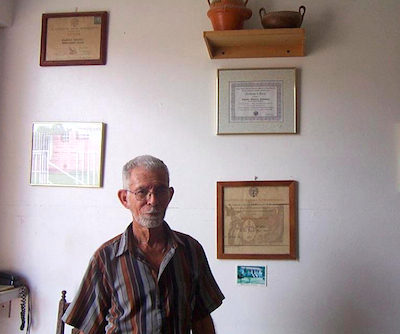 An expert in the field of early Puerto Rican recorded music, David Morales, is a valued member of our Cuatro Project. Recently he gave us digitized copies of extremely early recordings in wax of early singers and players, which we offer here. Puerto Rico's traditional "orquesta jíbara," from right to left, consists of: guitar, cuatro, güiro (scratch gourd) and bongo. (Jíbaro is a term that refers to early agricultural workers and subsistence farmers who lived predominantly in the island's central hills, considered the creators of the earliest forms of native Puerto Rican musical culture.) The Cuban bongo drum is a relatively modern addition, as is the Spanish guitar. The guitar entered the ensemble in the early 20th century as a replacement for the orchestra's original cumbersome, large, old folk guitars, the bordonúa and the vihuela. During the 19th century the jíbaros also configured their native folk instruments to perform creolized versions of European Salon or "art music"--genres such as the mazurka, waltz and polka. Jíbaros traveling to the towns and cities to sell their produce heard this music, liked it and took it back with them to the hills. They played their own version of these styles on their own stringed instruments configured into a grouping we now call the Orquesta Jíbara Antigua. 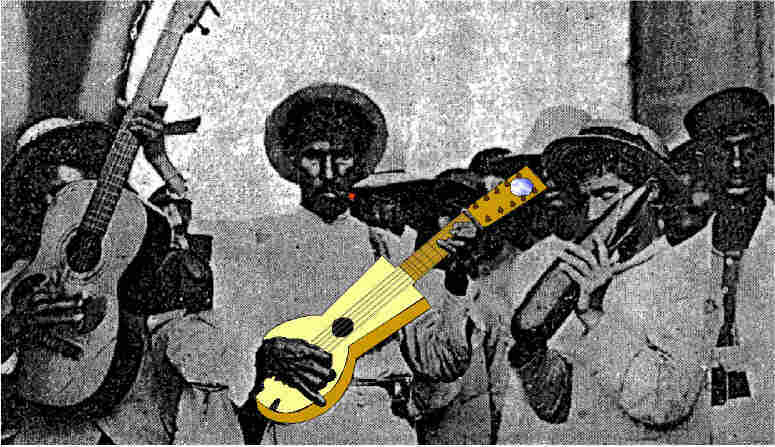 The Orquesta Jíbara Antigua then comprised a cuatro, a tiple, a bordonua and güiro. 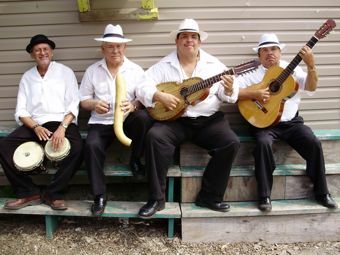 The photo above shows a contemporary jíbaro orchestra based in Western Massachusetts, with Junior Martínez on the cuatro and Victor Ríos on the guitar. The "Queen of the Mapeyé"
Felita Oyola: A life dedicated to art and culture. We regret to note the recent passing of the great Puerto Rican troubadour who preserved our cultural traditions in New York and especially in Boston, Massachusetts, in a career that spanned some sixty years. 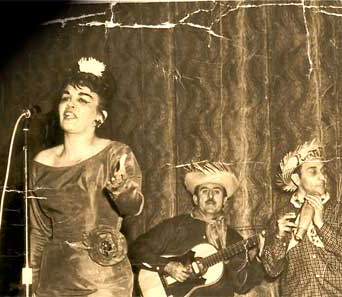 Felita’s career began with her debut in 1948 in the long-running radio program “Tribuna del Arte” (Showcase of the Arts) hosted by Rafael Quiñones Vidal, who gave her the name “The Queen of the Mapeyé.” Later in her life, accompanied by such famous traditional instrumentalists as Yomo Toro and Nieves Quintero, Felita became an institution in the city of Boston. We have created a page dedicated to this famous artist here. We have just added this beautiful historical photograph to our archive. 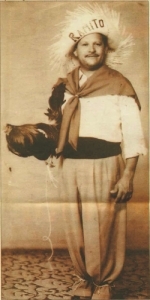 It shows don Marcelino Quiñones and his "southern" cuatro. Our cuatro has adopted several different shapes during its history. 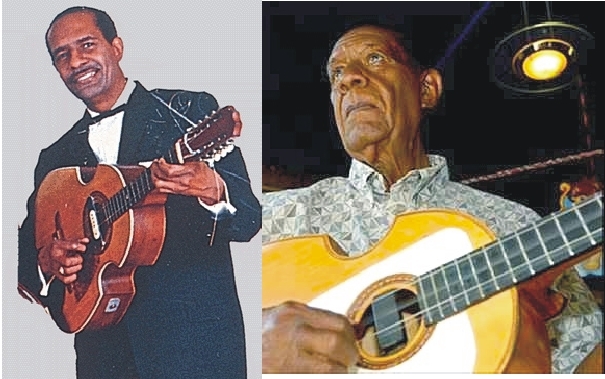 More about Marcelino Quiñones and his cuatro here. 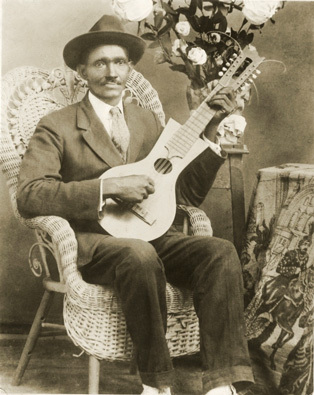 Immediately above is a historic photograph of Eusebio Gonzalez Ocasio, "El Indio de Sábana Grande," playing a transitional cuatro (a cuatro with the 10 metal strings of the modern instrument, but with the early keyhole shape) from an 1898 newspaper. We searched and found his son (an opera singer!!) and interviewed him about his father, whom Efraín Ronda--an early cuatro researcher--called “one of the great cuatristas playing before 1925." Our small island of Puerto Rico has not only its famous cuatro, but several different kinds of cuatros, plus an entire bouquet of other distinctive string instruments which have all but disappeared. See them all here. Nuestro Cuatro Vol. I DVD, there is a hidden gift video! When viewing the menu screen, press the enter/play key when no button is selected. NOTE: Many of our song samples play in a pop-up. Please turn off your pop-up blocker. "I admire your great dedication to your web page and your eagerness to make known our national instrument as well as the musical genres, musicians and composers connected to it." What have we added to our site since your last visit? Here you can see clips from our Cuatro Project video documentaries! Accomplishments of the Cuatro Project--And there are many! the great players, young, old; past and present. 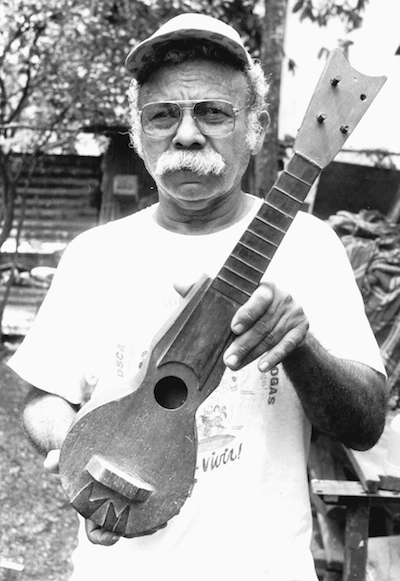 Flor Morales Ramos, "Ramito" was believed by many to be the greatest jíbaro troubadour of all time. The cuatro's main role was to accompany décima singers. So, what's a décima and who were the great décima singers? Why is the Cuatro Project necessary? "Too many of these youngsters think that just putting a Puerto Rican flag on their pants makes them Puerto Rican. We have lost a great deal. We are on the verge of becoming extinct."